Life is negotiation, and negotiations can save lives. Nobody knows this better than Thorsten Hofmann. As an investigator with the Federal Criminal Police, he was a specialist in the field of organised crime, especially in spectacular cases involving extortion or hostages at home or abroad. Using techniques of the intelligence services as well as the latest insights in neuropsychology, the author presents a succinct and highly effective guide on how to prepare, strategically plan, and successfully complete negotiations. Thorsten Hofmann studied psychology, criminology, and economics. 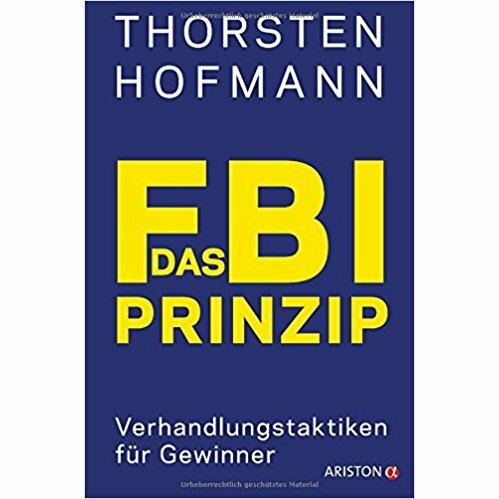 He worked for the German Federal Police for many years, where he was trained in various negotiation concepts and strategies. He is presently a negotiator in extortion and hostage cases for an international insurance firm. He is the director of the Centre for Negotiation at the Quadriga Technical College in Berlin, conducts seminars and trainings on strategic negotiation management, and advises organisations on complex negotiation processes. The book is available in every German bookstore and on Amazon.